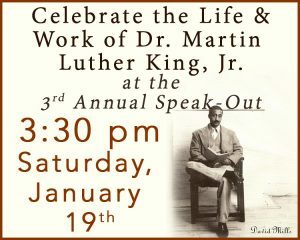 Speak-Out: Celebrate the Life and Work of Dr. Martin Luther King, Jr.
Join us and Brattleboro Solidarity at 3:30 pm on Saturday, January 19th,as we honor the life and work ofDr. Martin Luther King, Jr. with the third annual Speak-Out event! During this FREE event, Actor David Millswill embark on an engaging, dramatic presentation through the journey ofDr. King, as he transforms from his early uncertainties about Civil Rights into the historic and monumental figure he became. The program will highlight Dr. King’s, Letter from a Birmingham Jail, I Have a Dream, Promised Land, If I had Sneezed, and Early Days. Mr. Mills’ stirring presentation will take a look at both the public figure and the private man. After the performance, community members of all ages are invited to share poems, speeches, quotations, thoughts and songs in the spirit of Dr. King’s work. The program will conclude with a communal supper of soup and bread. This event is FREE and open to the public through the support of the Friends of Brooks Memorial Library and the Brattleboro Retreat. This venue is wheelchair accessible. David Mills appeared at Brooks Memorial Library and received great acclaim last year with his powerful interpretation of the writings of Langston Hughes as part of the Vermont Humanities Council’s First Wednesday series.